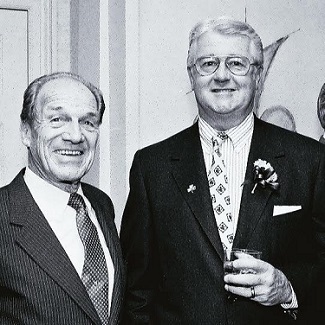 At a March 1991 St. Patrick's Luncheon of the Council, long-time Council Board Member Patrick O'Neill (left) chatted with Council President Dan Tully. It was with the deepest regret and the greatest sadness that we learned of the passing on May 10, 2016 of Daniel P. Tully, former Chairman & CEO of Merrill Lynch, now part of Bank of America. He served as President of the Ireland-U.S. Council from 1990 to 1993. He was 84. Merrill Lynch shares tripled during Tully’s tenure as CEO, from May 1991 to December 1996. Assets under management topped $500 billion for the first time in 1993. He retired as chairman in 1997 after 42 years at the firm. Daniel Patrick Tully was born January 2, 1932, and grew up in Jackson Heights, in the New York City borough of Queens. An early job was as copy boy for the New York Daily News. “When I was growing up, everyone in my family was a steam fitter, which was a blue-collar, union job,” he wrote in a contribution for “My One Big Break,” a 2004 book. “So my parents were shocked when I said I wanted to attend college instead of continuing that tradition.” He graduated from St. John’s University in Queens in 1953 with a bachelor’s degree in business administration. After serving in the U.S. Army, he landed a job in 1955 as a junior accountant at the partnership then called Merrill Lynch, Pierce, Fenner & Beane. “I didn’t know what the company did, and neither did anybody in my family,” he said. His path up the corporate ladder included a seven-year stint in the firm’s Stamford, Connecticut, office. Tully was named a vice president in 1971, president of consumer marketing in 1984, president and chief operating officer in 1985. He was deputy to CEO William Schreyer and succeeded him in May 1992, adding the chairman’s role the following year. He is survived by his wife of 59 years, Grace; children Daniel, Timothy, Eileen and Elizabeth; 13 grandchildren; and two great-grandchildren.